Yesterday was a good day. I started it off with another big walk. I had intended to get a cab to the tabla flat, but ended up walking the whole way there. It took about an hour and a half. When I got there the door was closed and everything was quiet. I poked my head in and said hello. There was a guy standing there quietly staring at me and I asked if I could use the phone. I called George to ask if he would translate for me and ask the guy if it was all right for me to practice. The guy said yes and I grabbed some drums and went to town. Shortly after a nice lady named Chhaya Gupta came from one of the rooms and said hello. She is from Toronto, Canada and is here for the festival as well. We talked a lot about education and doing workshops to introduce Indian Classical music to the school systems. She is a sitar player and vocalist. We exchanged numbers and she went back into her room. As I sat down again to practice, a pakawaj player walked through the door and sat in front of me. His name was Bhaskar Mukherjee and he is from Calcutta. He said there was to be a rehearsal in the room at 11 a.m. and he was here for it, (it was already 11:15….did I mention IST?). I began to get up and he said, “keep practicing till they come”. So I did. He grabbed a set of tabla and showed me a bunch of stuff. He was really good. He said that he has performed all over the world on the pakawaj, and that he will be performing on Sunday as part of the opening ceremony. We played until 12:30 and then people started to show up. He was visibly upset at their tardiness. 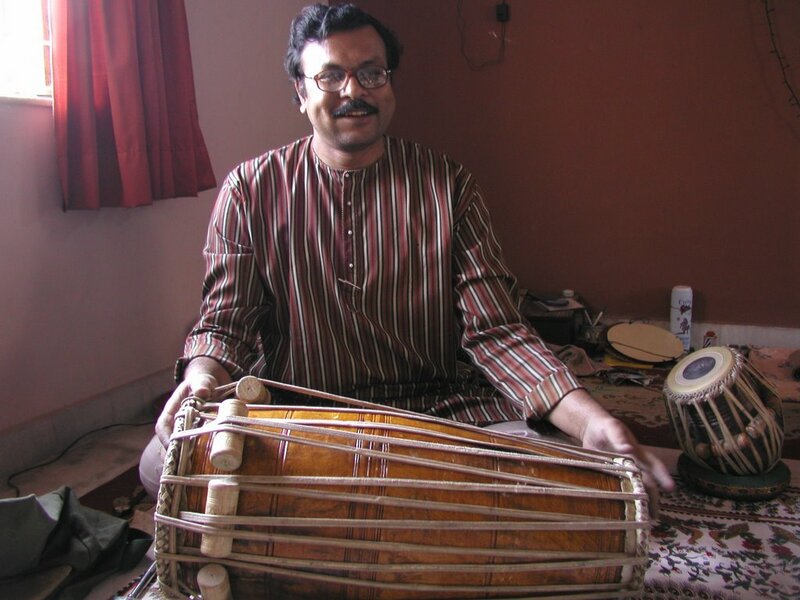 I headed downstairs and sat with the tabla maker again. I guess I should mention that when I say tabla maker I am talking about the storeowner, but there are about 4 people who work there, including his brother. From what I see, he is the guy that does all the finishing touches and fine-tuning, and the others do more preparation work, like stringing the heads. I learn more and more every time I sit with them. I am starting to see more detail in what they do and I can understand why he is so good. He spends a massive amount of time tuning and adjusting the gob. He has a tuning pitch whistle next to him at all times, but I have never seen him use it. I desperately want to ask questions. After a couple hours I got a cab and headed to a restaurant that I saw the day before. The food at the mission is great, but it is always the same, so I wanted to change it up a bit. I went to a place that served a mix of Chinese and Indian food. I had some corn chowder, fried rice with noodles and some water. It was a welcome change. When I was done I walked down the street a couple of blocks to a shopping district. I began my quest for gifts for friends and family back home. I wanted to get back to the mission in time to take a little nap before the concert, but after shopping I ended up at the cyber café checking e-mail, which took me right up to showtime. I rushed back home changed, and hitched a ride with Manu and his parents. It is becoming surreal to walk into the theater every night and feel the anticipation. I have noticed the crowd has changed slightly depending on who is performing. It is hard to believe that such a high caliber of performance can exist every night for 8 days. I feel like I have seen a years worth of great music already. I am definitely feeling spoiled by this amazing event. On the bill last night was a tabla solo by Sanjay Mukherjee, a vocal performance by Arun Bhaduri, and a sitar performance by Monilal Nag. Once again, the tabla solo was amazing. Pt. 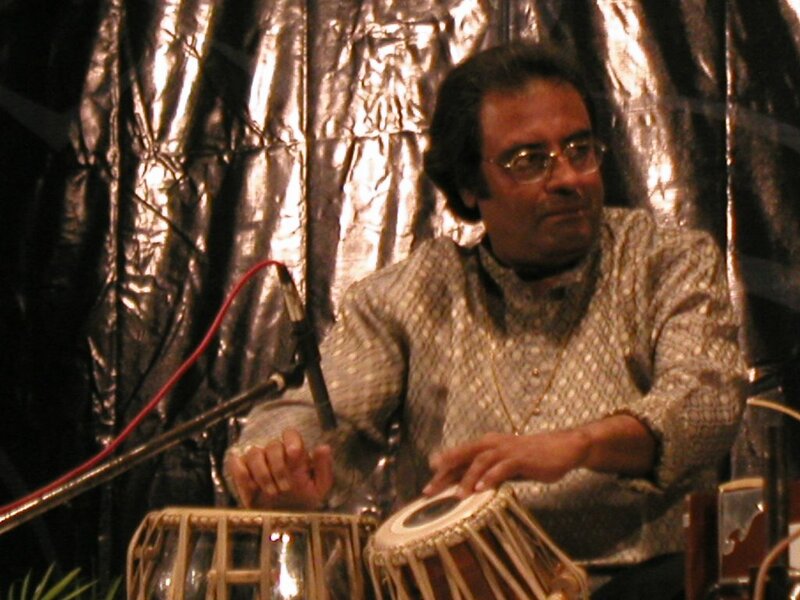 Mukherjee played a straight tintal solo (16 beats) and displayed all the technical skill and prowess of the previous performers. He had a thing that he did where he would stay on one phrase for a long time and go from quiet to loud while maintaining high speeds and it always got applause from the crowd. He told a story of the last day he and Anindo (Chaterjee) went to their guruji together for a lesson. 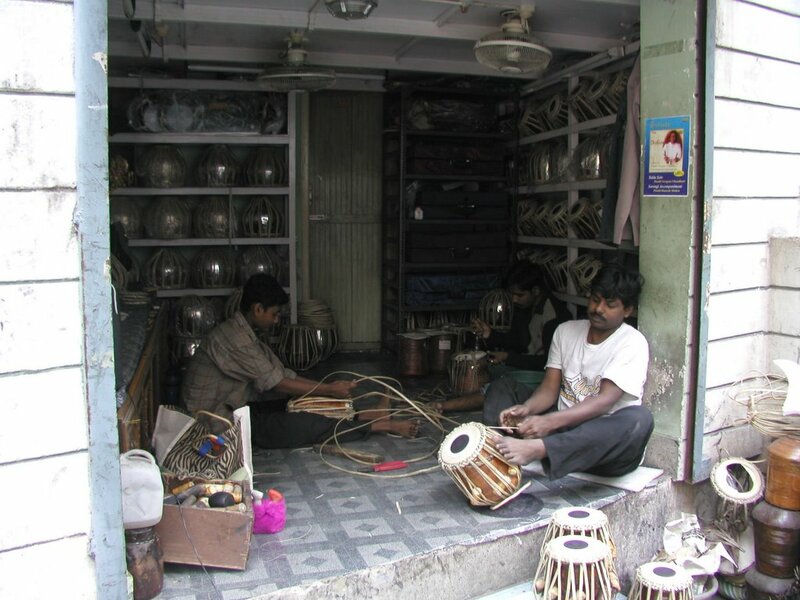 He bit of fun with them and composed a composition on their heads, one head as the tabla and the other as the bayan. 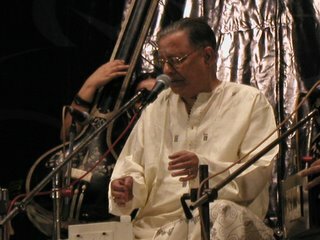 This was his last lesson before his guruji passed away, so now he plays the composition in tribute. The vocalist was probably one of the eldest I have seen in the festival. His voice was sweet and smooth. He had a shake in some of his lines that made his voice sound like it was running through an old fender vibe amp. His hands and body moved with every note he sang and the form of his pieces were easy to understand and follow. 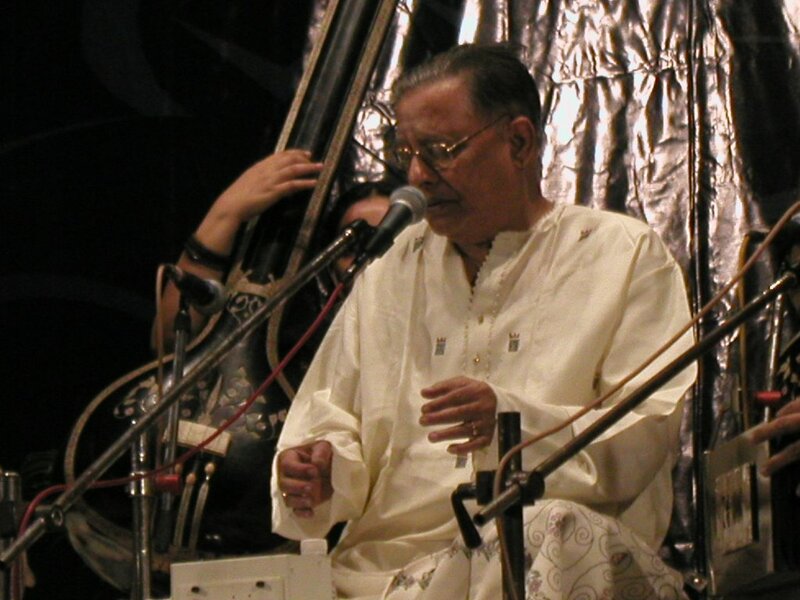 I will leave this festival with a whole new appreciation of Hindustani vocal music, and Pt. Bhaduri is a big reason for that. During the break between the vocalist and Sitar performance, Manu, his parents, and myself all decided to go get something to eat and skip the last performance. Because the festival runs so late, we have not gotten to have dinner since it began. Not to mention we were all dead tired from a long day, so we went to a restaurant that was right next door to the theater. I was sorry to miss the sitarist, but I was happy to get to bed early with food in my belly. This morning I feel much better and ready for the second half of my trip to begin.